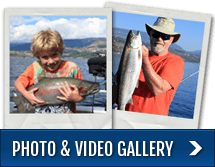 Rodney's REEL Outdoors | Delta Grand Hotel Kelowna, B.C. Visit Delta Grand Okanagan Resort for the finest in BC hotels. The Grand offers 390 guest rooms and suite accommodations, all offering lake, city or mountain views. Our friendly, helpful staff are ready to make your stay simply grand! Located only a short stroll from Kelowna’s main downtown core with Trophy Rainbow Fishing literally at your doorstep, who can think of a better reason for coming to Kelowna! All of our packages include water front pick up at Delta Grand Okanagan Resort in our fully equipped Thunderjet boat, all safety and fishing equipment and a box or shorelunch upon request ($20.00 per / person) Your guide will be a friendly knowledgeable Licensed Fishing Guide. Your comfort and enjoyment comes first when you choose Rodney’s REEL Outdoors fishing charter service. The Okanagan Valley offers many types of fishing opportunities. Because we operate twelve months a year, we are able to put together a package that’s right for you. From trolling the big water of Okanagan lake for Trophy Rainbows, Fly Fishing the Mountain Lakes or Ice Fishing you are sure to have a memorable experience. Accommodations at The Delta Grand Okanagan Resort. For accommodation information please contact the resort at 1.888.236.2427 for availability and best available rates. You may also click here to check online. 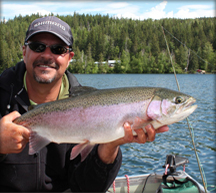 7-8 hours of guided fishing for Rainbow Trout, Kokanee, Lake trout and Bass. Box lunch or shorelunch for each day of guided fishing upon request. ($20.00 per / person) When ice fishing all food and drinks for the day are included in the charter cost. Private dock for your safety and comfort when fishing Okanagan lake. There is an added cost for pick up and return from the hotel when fly fishing, Bass fishing and ice fishing as our departure is from West Kelowna. Please ask for details when booking. Fishing Licenses, 5% GST and Gratuities are not included in any package.